Connection cord set for PC terminal - for unity processor - 1 m. Standard environment. Accessory separate part type: Connecting cable. Accessory separate part designation: Connection cordset for PC terminal. Accessory separate part destination: Unity processor. 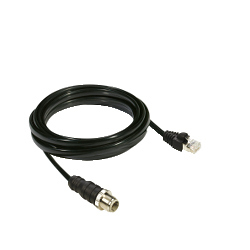 Modbus Plus Tap - standard Modbus cable with 1 x RJ45 connector in front - IP20. Standard environment. Accessory separate part destination: Modbus Plus network. Modicon Quantum lithium backup battery - for CPU - 3 V DC - 10 yr. Standard environment. Accessory separate part type: Battery.